The original title of this film added a slightly indulgent "The Unnecessary Death of" before stating its titular protagonists name. I still thought that the title until I realized it had been cut short to simply introduce us to Shia LaBeouf's character and the man in which we would be following on this journey that's described simply as him finding love in a Romanian beauty only to become entangled in the drama her intimidating and very violent ex-husband brings to her life. The film is being modest though in this description as Charlie Countryman has much more to it than a simple love story and both visually and dramatically it is consistently striving for something more, something important and more substantial than what it appears to be on its surface. I can see how it would be easy to take this film as first time feature director Fredrik Bond finding his footing and infusing writer Matt Drake's screenplay with a strong sense of style and visual flair that would allow it to appear as nothing more than an exercise in artistic freedom, but as I took the film in I couldn't help but to feel they were really trying to accomplish something here. Drake has only penned a few screenplays in the past, his only feature being what couldn't have been more than a sketch outline for 2012's Project X, but once that forgettable paycheck project was out of the way it seems he was ready to really invest in something he was creating and thus we have the plight of Mr. Countryman. I've always had a soft spot for LaBeouf simply because I enjoyed Even Stevens so much as I was growing up and was happy to see him go on and find success in big-budget blockbusters, but as he's grown up too it is clear he wants to challenge himself and feels a want to find material that is more satisfying for him to look back on, something he might actually be able to be proud of when he hits fifty; at least moreso than watching himself run from CGI robots. With this film he has at least proved he has the capability of accomplishing such a feat even if the overall project may seem somewhat lacking. 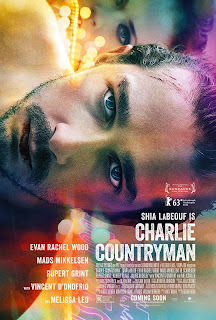 Despite the name change there are still plenty of over-indulgences in the film as it's never sure of what it wants to be and its tone skips around so much that we sometimes don't know with what context we're supposed to accept a scene, but more times than not Charlie Countryman is an entertaining if not introspective look at how the soul compensates for loss and continues to love. 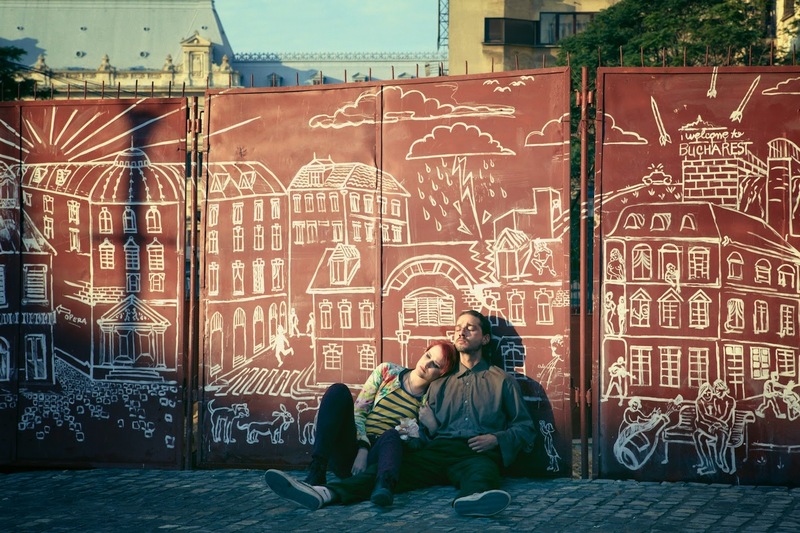 Shia LaBeouf and Evan Rachel Wood in Charlie Countryman. Beginning by introducing us to Charlie as he sits with his step-father (Vincent D'Onofrio) as they prepare to take his mother (Melissa Leo) off of life support. It is as this process happens that we watch the innocence of life be taken from Charlie's breath as it re-invigorates his eyes as if in those final moments of his mothers life a miracle could happen. He sees her finger move slightly, her eyeball movie underneath its closed lid and he imagines for a moment every scenario of what could or should happen. Does he tell someone what he saw? Is he sure he saw what he thinks he did or is he just desperate? If he was to scream out for them to stop would it be justified or would he look like a crazy person? He doesn't know what to do and so he does what many of us, complacent in our lives, afraid to overcomplicate things do, and exits the hospital room essentially giving up all responsibility that he had in the life of his mother. He doesn't want to know that he should have done something more, he wants to be comforted in the fact that there was nothing more he could do and that the professionals around him know better what is best for everyone. Still, no matter how legit these thoughts might be in a logical sense he will always have that unshakable feeling he should have done more and because he was afraid to disrupt the order of things he did not. Was his mothers life worth not taking that chance? He will never know, but in some kind of dream/hallucination outside of her hospital room she appears to him and all Charlie can think to do is ask for direction and what he should do next in his life. "Go to Bucharest," she says and he promises her he will. Even as she gets up to leave him and he knows it's likely the last time he'll ever see her LaBeouf captures in that moment what it is about life that is so fleeting, all that he will miss about her and that even the smallest things like the texture of skin, the certain way the hair falls, the particular facial expressions all combine to form someone he will never meet or be able to reach out for again. It is a thought process that is self-destructive and it does nothing more than shake Charlie to his core yet it also forces him to step up and commit to doing what he promised his mother he would. He boards a plane to Bucharest and meets a man on board named Victor (Ion Caramitru) who he begins speaking with almost against his will, but who he seems to find oddly intriguing. They discuss many things, but the point of discussion that sticks with Charlie is that of his daughter and how much Victor loves her. This no doubt resonates with Charlie because of his recent loss and it all seems a pleasant moment, a precursor of promising people he might meet on his journey, but instead things take an weird turn and when Charlie wakes up from a nap, Victor's head resting on his shoulder, he finds that his new friend has no pulse and appears to have passed away. It is strange and a bit of a shock to the audience as well. Is there going to be more to this film than action and romance promised by the trailer? Are there super natural aspects? Is Charlie being followed by death? These aren't so much answered but ignored as our titular hero lands in Bucharest and winds up meeting the daughter Victor spoke so fondly of. Gabi (Evan Rachel Wood doing her best Romanian accent) is a cello player in the orchestra of the Bucharest Opera House, a passion she has learned from her father and who has a seedy ex-husband in Nigel (Mads Mikkelsen who won rave reviews for his performance in The Hunt earlier this year). These interests become more relevant as Charlie becomes more and more fascinated with Gabi and her world and allows himself to become more invested in what her life will turn out to be after the loss of her father as its almost as if Charlie feels this is the reason his mother told him to travel to Bucharest. Without giving too much more away of what unfolds concerning the story one of my favorite aspects of the film was the fact that we never actually knew what to expect from it or what direction it might take. We are introduced to so many different potential leads such as Gabi which is a main focus, yes, but a young man such as Charlie could have found it easy to become distracted by the likes of Luc (James Buckley) and Karl (Rupert Grint) whom he meets when finding a place to stay in this new city. The fact he gets entangled in a bit of a mess with these guys that leads to a confrontation with Darko (Til Schweiger aka Sgt Hugo Stiglitz) is only more of a sign that his fate lies with Gabi and that he might have to face what he knows to be true and disrupt the order of things to secure a life-long relationship with her. Gabi and Charlie soak up the sun in a rare moment of peace between them. Those themes, those thoughts and ideas portrayed early on by LaBeouf travel with him all the way through the course of action he takes on this journey. Never does he lose sight of what the original goal was or the feelings that caused him to end up where he is now, even as he is suspended upside down over water he looks into Gabi's eyes and can at least feel satisfaction in knowing he went for it, he did all he could and if he's going to die it will be with little regret and that is more than he could say as he watched his mothers life slip from her body. Director Bond embellishes these hallucinations and determinations with plenty of style to spare as he comes mainly from a background of music video directing. This is especially evident in the number of slow motion shots we get set to various music stylings that fit very well into the classical career of Gabi and the techno underground that matches the exotic European environment. While this could easily be taken as a substitution for actual substance I was engrossed in the inner-dialogue and conflicts of our main character from the first time we meet him. Do I think this is the role that will define LaBeouf as a more mature, serious actor? No, I know it won't, but I know that he has it in him to elicit the emotional weight a character might need to transcend the material and lodge themselves in our memory. Even though Charlie Countryman isn't that role I hope he finds it, whenever it may be, and is able to show the pessimistic critics out there that this film, while nowhere near perfect and admittedly sloppy in places, is a glimpse at the talent he has for instilling his characters with real, raw sensibilities that extend further than even the writer might have imagined. There is obvious passion here and that not only comes through in the performance from LaBeouf, but from his co-stars Wood and Mikkelsen as well as Buckley and Grint bringing a fair amount of comic relief to a piece that is asked to bounce back and forth between heavy drama, suspenseful action and goofy comedy. I don't believe there is another way to put it when a film immediately pulls you in as this one did, but Charlie Countryman succeeds at delivering a wake-up call to those who think they've lost their way; those that need reminding it shouldn't take a great tragedy to realize we don't always see the true value in things and, as cliched as it might sound, that love makes life all the more meaningful, even if it isn't necessary.